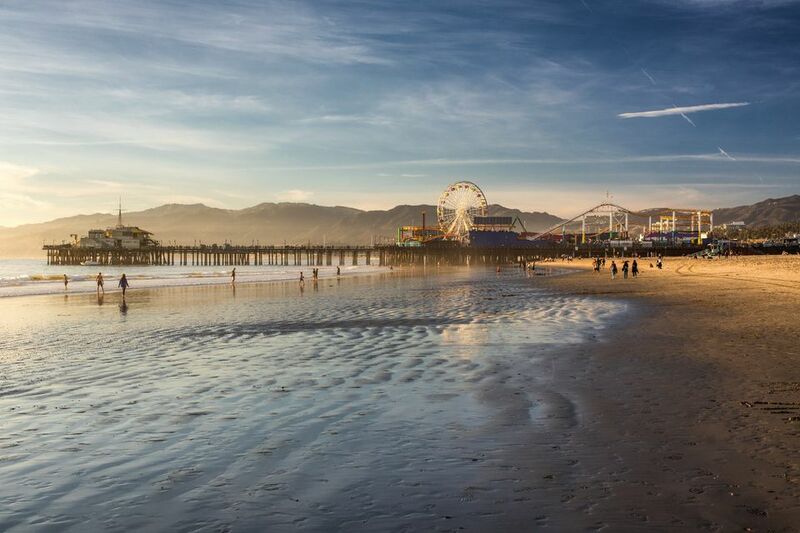 Santa Monica locals will tell you the restaurants on Santa Monica Pier are generally over-priced, unhealthy and unspectacular compared to Santa Monica's better restaurants, but tourists don't seem to mind. Tripadvisor users (travelers) rate the pier restaurants as better quality and better value than Yelp users (mostly locals). You're paying for the location and the view more than the food. Food prices can be more reasonable than drinks at some sit-down restaurants. The Albright is a rebranding of former Santa Monica Seafood, with the next generation of the same family taking it up a notch in quality and service, which has paid off in popularity. It's still a seafood joint, so don't go for the burgers. Of the other eating establishments on the pier itself, Pier Burger gets the highest marks from both locals and travelers as being a tasty, if not particularly large, burger and fries for a reasonable price. For a quick snack, the food court at Pacific Park Food Court includes brand names you'll recognize, like Taco Bell, Coffee Bean and Tea Leaf as well as pizza, burgers and carnival favorites like funnel cake, churros, and Dippin Dots, to name a few. Soda Jerks, inside the Carousel Building, has old-fashioned ice cream sodas, shakes, sundaes, and other ice cream specialties. Families with kids, or frat boys who like to watch the staff run, may enjoy the experience of Bubba Gump Shrimp Co. Rusty's Surf Ranch sometimes has live music and dancing for a cover charge, but the food is nothing spectacular. Mariasol, at the end of the pier, has a great sunset view. Some of the best food at the pier is actually just above the pier on Ocean at The Lobster. The food is good and it's a great view over the pier, but the tables are too close together and it's quite costly (especially the lobster). If price isn't an issue, ordering a picnic from The Lobster to enjoy the sunset on the beach, or the bluff, can be a nice option. The Food Court is inside the Pacific Park amusement park section of the pier, but there's no admission, so it's accessible to everyone.